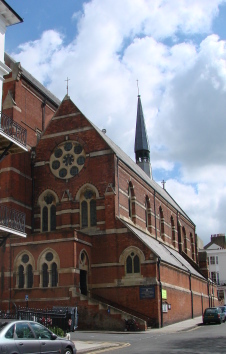 St Michael’s serves the Italianate houses in the Montpelier and Clifton Hill areas and in 1858 the district was allocated by H M Wagner, vicar of Brighton, to the Rev Charles Beanlands (1823-98), a wealthy bachelor who had been A D Wagner’s curate at St Paul’s (1 p3) and was by the standards of the day an advanced ritualist. The understanding was that Beanlands would raise the funds for a new church for what would become an ecclesiastical district. Beanlands was the incumbent for 38 years (Maughan p74) but a separate parish was only created in 1924. The church built by Beanlands between 1858 and 1861 is by G F Bodley (B 93 p448),and cost £6728 (Sawyer III p214). Because of initial difficulties in acquiring sufficient land, Bodley’s church had to be squeezed onto a relatively small site. Today, as it is joined to a larger and later church, the initial impression is of a rather over-sized aisle. It is, however, much more than this. Many other, mostly lesser, churches in a similar idiom followed it in the 1860s, so it is difficult to realise how uncompromising it must have seemed when built. Michael Hall (p59) suggests that some of its novel features may have been determined by Beanlands. Such features start with its red brick construction inside and out, relieved by bands of stone and darker brick, even though brick was usually seen as a sign of economy. Instead of the Middle Pointed style preferred by the Ecclesiologists, it is in what was considered to be North Italian gothic (Maughan p75), as favoured by the increasingly influential John Ruskin. Small wonder that contemporaries were perplexed, like M A Lower, who likened it to a continental hôtel de ville (I p83). 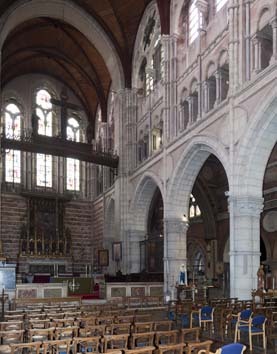 The proportions must also have seemed strange, with low aisles (the south one remains; the north one according to a photograph of c1880 (Halls plate 30) was similar) that have windows only in the ends and in the south chapel near the east end, and tall clerestory windows. These have thick plate tracery, as do the others, including a circular one in the west gable. There is no tower, just a slender flèche at the join of nave and chancel. 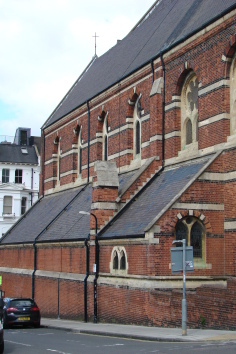 Like many Brighton churches, St Michael’s is on a slope, with a west porch approached up a flight of stairs. Bodley’s interior is not as large as some churches of the period, but is as unconventional as the outside, not least in its use of movable chairs in place of the still usual benches or pews. The surviving south arcade has squat, heavy piers with big foliage-capitals and large blank circles in the spandrels; these were intended to be carved (Hall ibid). The interior is austere and dark, surmounted by a kingpost roof. The chancel has similar proportions, behind a tall chancel arch, which has stumpy shafts on the responds for the inner order of the head The south chapel was originally an organ-chamber (1 p5) which probably explains the simplicity of its architecture. 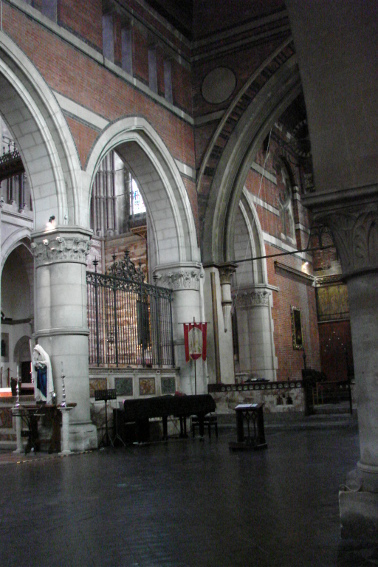 From the aisle it is approached through a plain half-arch and the double one to the chancel is little more ornate. 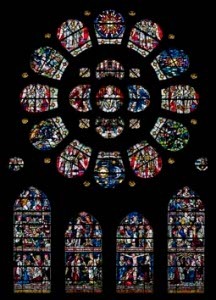 The interior was from the beginning enhanced by fine glass and other fittings (see below), though Bodley’s intended painting of Christ in Majesty over the chancel arch was never carried out. Within a few years the church was clearly too small and Beanlands managed to acquire more land north of Bodley’s church, with a view to enlarging it. In 1865 he obtained a design from W Burges (Maughan p75) for a taller but only slightly longer structure, entailing the removal of Bodley’s north arcade and aisle. It is uncertain why Bodley was not asked, though Burges had already designed metalwork and other fittings for the church (Crook p211) and also a house in Yorkshire for a cousin of Beanlands (Antram and Morrice p48). Maughan suggests that Bodley, whose style was undergoing a major change at the time, now disliked his earlier work and was unwilling to design anything in a similar idiom (p74), though according to Maurice Adams, his contemporary (quoted in RIBAJ 3rd series p340), Bodley regretted not being asked. However, J M Crook (p213) also mentions a quarrel over the placing of the Flemish reredos (see below). Whatever the reason, a shortage of funds meant that Beanlands did nothing until 1892, when Burges was dead and J S Chapple, a former associate, was employed in his place (B 65 p110). His work, which was completed in 1899, follows Burges’s design, but with changes. The windows mostly lack tracery and the bands of stone in the brickwork do not have any darker brick by them. As the church stands, it follows Bodley’s example by dispensing with a tower. According to Sawyer, Burges’s original design called for one (III p214). Simply on the basis of this statement it is hard to see how anything large enough to be in proportion could have been built, but it appears that this was intended to be a campanile, with a cloister (BE(E) p162) and thus presumably free-standing. 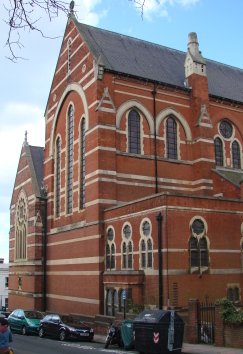 The new church is probably second only to St Bartholomew among Brighton churches in its height and is wider than Bodley’s. Despite the compromises with Burges’s original plan, it is a magnificent composition that was widely admired even in the years that Victorian architecture was largely rejected. It is able to stand up to Bodley’s equally remarkable work whilst remaining true to its own distinct aesthetic. Though the mainly brick exterior respects its predecessor, the interior is faced with stone and this helps to make it lighter than Bodley’s. Burges uses a more conventionally proportioned French style, with a bay-elevation divided into the classic three parts, with a triforium and deeply recessed clerestory, two openings to a bay. The carved foliage capitals of both arcades are by T Nicholls (1 p11) and were not completed until 1912. The upper two parts are contained within single arches, an ingenious solution to the problem of combining a developed triforium with a clerestory. Borrowed from Bodley are the circles in the spandrels of the arcades, here divided by shafts rising to the vault. This is of wood, though Burges intended a stone one (Maughan p77). The east end, behind a tall but unobtrusive arch, is not a fully developed chancel, so the sanctuary extends into the nave. Because of the limitations of the site and the need to be joined to its predecessor, the new church is arguably too short for its height and its relationship with Bodley’s church might at first sight seem uncertain, since the latter is too large for an aisle, as its position might suggest, yet it is obviously more than a side-chapel. In practice, it has found a valued use for smaller services, processions and cultural events, so that it maintains its own identity, whilst continuing to be part of one single church. After work finished on the new church in 1899, attention turned to its fittings (see below), which had to stand up to the remarkable ones in the Bodley church. 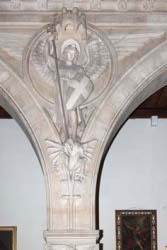 The next significant structural change was the west organ gallery of 1912, on two arches with figures of St Michael and the angels in the spandrel. The figure of St Michael has been given to T Nicholls or his son (1 p11). Two years later, W F Romayne-Walker decorated the sanctuary (B 158 p580), with lower walls faced in alabaster and a piscina. In WWA 1914 H C Ingram claimed to have been involved in a restoration of the church but gave no date. It was most probably the work of 1912, as Ingram was in practice by himself from 1901 and he would have been unlikely to have claimed such a restoration if he had still been with another practice. Altar piece: (South or Lady Chapel) C Hare (RF) with a carved Annunciation. Font: By Bodley; an octagonal bowl of grey marble with varied arcading on the sides (Verey p82). Glass: Morris and Co and designed this in 1862-63. It was some of the earliest produced by the company. Bodley was closely involved with them, particularly over the use of clear glass backgrounds. This led to suggestions that he should become a partner in the new firm. 1. 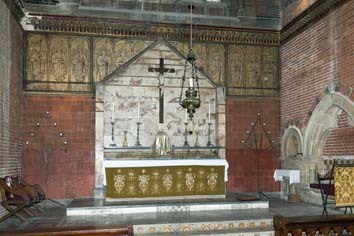 (South chapel) Small, by Morris and Sir E Burne-Jones. The east window shows two scenes from the Resurrection, set in uncoloured patterned glass. One roundel is by P Webb (RF). The south ones have scenes from the Nativity, filling the spaces with figures fitted to their shape. The colouring, based on yellows, greens and browns, is distinctive. 2. 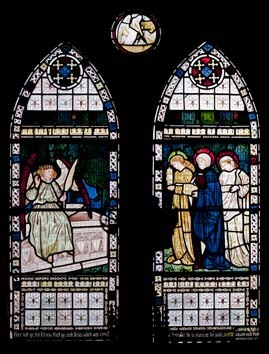 (West window) Burne-Jones and Morris, with P Webb and F M Brown, with a similar colour scheme. 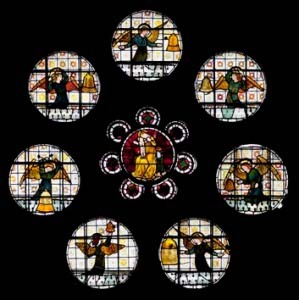 In the centre is the Virgin, with angels in the outer roundels. The archangels in the lancets below are by Morris and Brown, though the face of Raphael is by D G Rossetti – the rest is by Morris (RF). In the sexfoils are Morris’s Annunciation and the St Michael is by P P Marshall (see Harrison in Parry (ed) p108 for more detail). 3. (South aisle west window) By Burne-Jones and presented by Bodley in memory of his father (Harrison p122). Dale suggests (p129) he had a hand in the design. Webb is said to have redrawn the two angels in the head (BE(E) p163). 4. 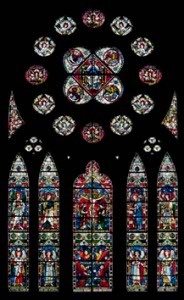 (East and two south chancel windows) Tree of Jesse and figures by Clayton and Bell, 1862 (Maughan p81) and actually the earliest glass in the church, before Morris and Co were involved, though Michael Hall suggests (p64) that a second maker may have been involved with the aim of having as much glass in position as possible when the church was opened. 5. (South clerestory, first and third windows) Worrall and Co, c1889 (www.stainedglassrecords.org, retrieved on 18/2/2013). (Clerestory – second and fourth windows on south side of old church) Clayton and Bell, 1862-63 (ibid). Lectern: (In sanctuary) A thin wrought iron stand with leather panels was supplied by C E Kempe, 1862 and was one of his first works (Harrison in Parry (ed) p47). 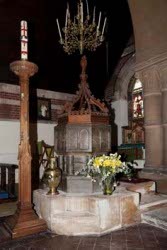 The present lectern is of iron but there is no leather, which suggests that this is Kempe’s original altered, though it is similar to the one in the new church. 1. (Chancel roof) Painted flowers that are now darkened. There is some doubt about the authorship, as it is variously stated either have been painted by Morris and Webb, with another partner C Faulkner (Verey in Fawcett (ed) p88) or by Webb alone, though Bodley may have had a hand in the design (M Hall p63). 2. (East end above altar) Paintings on paper by F Holford, a former churchwarden, probably of the 1860s depicting individual angels against a gold background. 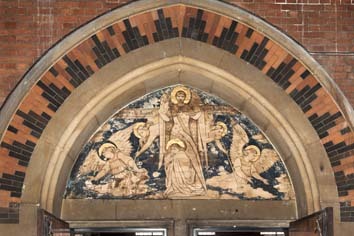 Nicholas Antram suggests (BE(E) p163) that the painted angels over the west doorway may also be by him. Reredos: Antwerp work of c1500. A large triptych with carved and painted scenes from the Passion. When installed, C E Kempe was paid £400 to restore it (Sawyer III p222). [NB. This is currently dismantled awaiting conservation]. The wings were added by Kempe ( 1 p5). 1. 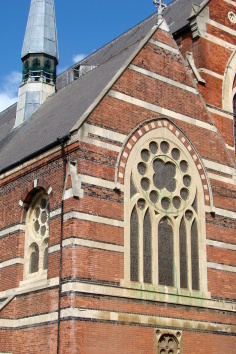 (East and both upper and lower west windows) Designed by H W Lonsdale and made by W Worrall and Co, the successor of W G Saunders, 1895 (Arch J 2 p103). Both had been close to Burges. 2. (North aisle, second to fourth windows and west window) Kempe and Co, 1912-15. 3. (North aisle, first window) Jones and Willis, 1911 (www.stainedglassrecords.org retrieved on 4/2/2013). High Altar: T Moore, made of two different marbles with attached columns, 1914 (Maughan p79). Pulpit: Simple Cosmati-work with sides of green marble, standing on a pillared base. Designed by Bodley and moved here (Dale p129). 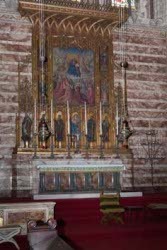 Reredos and sanctuary: Large, with gilded wooden figures under canopies beneath a painting by Romayne-Walker (ibid p134) and part of his scheme. The low surrounding walls of Cosmati-work with ironwork are probably also by him. Rood: Oberammergau work, carved by P Rendl (ibid). Stalls: Designed by Burges for the original church and thus one of his first commissions here. They were moved to the new church (Maughan p78). The misericords are by T Nicholls (Antram and Morrice p50). 1. My particular thanks to Fr Robert Fayers, who has added considerably to my information about the fittings of the church; the information he has provided is cited as from RF. In addition, he has given me valuable insights into the way the two parts of this remarkable church interact, despite the unconventional layout.